There are different types of browsers written in different codes for different products like web browsers, android browsers, windows browsers and the browsers that work on the iPhone known as the iOS browsers. So the most important thing to do after one getting an android phone is to choose the best android browser for one’s device. Since when we operate a browser, we get used of that browser which makes it very difficult to change browser after operating one. 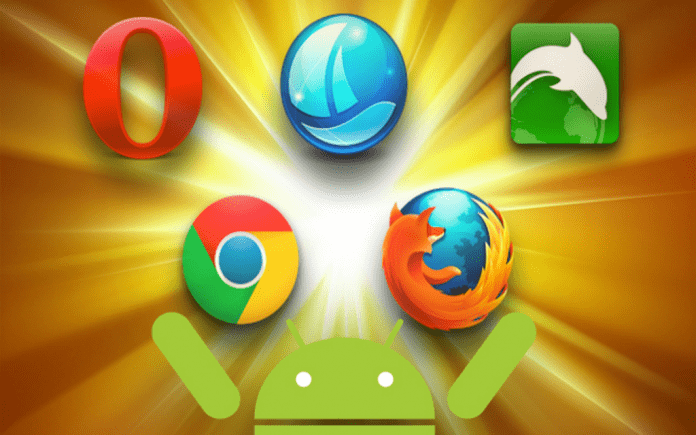 So one must look at the list of current best Android browsers and their features so one can use the right one for them from the beginning itself. Dolphin Browser includes various eye catching themes, flash support and even online customer support where one can directly contact a technician of the dolphin browser team. With the advent of Google AdSense, every website is full of annoying advertisements which frustrate people so dolphin browser gives an option of blocking unwanted ads and remaining incognito without having to install any extensions. Although the Firefox browser developed by Mozilla was not at the top of the web browser list, it sure has managed to find its top place among the list of best android browser, with very elegant design and all necessary options like bookmarks, developer tools, privacy settings, history. Flynx and Link Bubble are the two best android browsers which provide the androids users a unique option to use a floating window instead of full screen increasing the level of multitasking on the smartphones. If one has to do really important work online and privacy is a big issue since most browsers collect the private data to use it to provide enhanced customer experience, Ghostery is the best android browser whose extensions that are even available for the Firefox and the google chrome can even help one take control over trackers by viewing and even blocking them. Mercury browser which was originally an iOS browser is also now available for the android users. Along with privacy mercury browser is known for its security. For people who love speed, the naked browser is the best android browser they should install. This browser may not look the most beautiful and eye-satisfying but its speed is the best among all. Opera browser is the browser which has gotten the most number of updates in features on the play store. Nowadays this browser allows its users to save websites and interesting information at great speeds. New features are being added every single day and have four different types of browsers suiting various purposes. What separates a Puffin browser from rest of the competitors is a virtual mouse pad which is missing in every other browser on the list of best Android browsers. Last but definitely not the least UC browser is best android browser known for its best design among all the other browsers. Since the majority of internet users are from the USA, so it makes sense to design a product based on the maximum product usage areas. UC browser is the only browser which is solely not aimed at the United States. UC browser has received the most amazing reviews in the whole play store.